“Stand still, close your eyes, and listen. What can you hear?” says Sumit Kar, Conservation Officer for Satpuda Foundation, part of Born Free’s Living with Tigers programme. 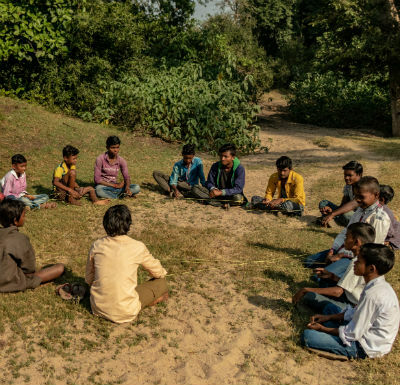 I’m on the edge of the forest near Khamba village with Sumit and a group of local children. It may be early on a Sunday morning with the village in full-on preparation mode for market day, but that hasn’t stopped 17 children gathering for a nature trail to learn more about the diverse wildlife they share their home with. With our eyes closed, we can hear faint sounds from the village, a barking dog, rustling leaves, and at least seven different birds. Khamba is in the buffer area of Pench Tiger Reserve and close to the core*. Sumit tells me the nature trails – which Satpuda Foundation has been running since 2005 – are designed to not only encourage children to respect and appreciate wildlife, but to also ensure they are safe if they enter the forest. Sumit then explains to the children what core and buffer areas are by creating a diagram in the sand using sticks and seeds. The children point out the position of their village on the impromptu diagram. I ask the children if they have ever seen a tiger. Half of them raise their hands. The children then sit down in a circle to play Web of Life. 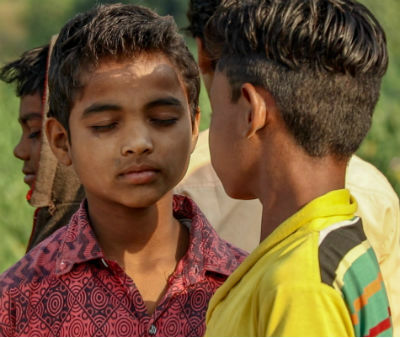 Sumit pulls out a ball of string and gives the end to one of the children. “You are a tiger,” he says. He then unwinds the string, and crossing the circle asks another child to hold the string. “You are a tree,” he says. Sumit carries on until all the children are holding the string and have been designated a role. Web of Life demonstrates that all life is connected. He asks the children to pull the string tightly, and touching parts of the string, shows them that it is strong and can’t collapse. He then asks the children who are trees to let go. The string collapses, affecting not just those designated a tree, but everyone else. The teaching resources used on the nature trail may be limited, but the knowledge the children will gain will hopefully last a lifetime. 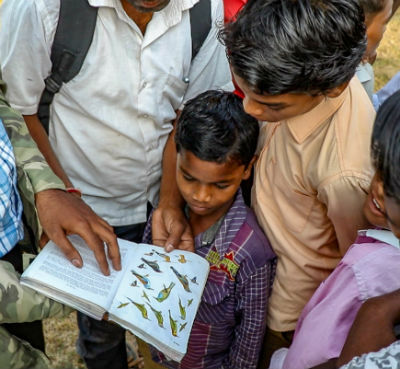 It is crucial to not only protect the diverse wildlife of Satpuda for children like these, but to also teach children to love, conserve and respect the wildlife that surrounds them. Initiatives like nature trails are happening right across Satpuda thanks to Born Free’s Living with Tigers programme. With your help, we can safeguard wild tiger populations and educate more people on the importance of conservation and approaches to co-existence. *You can find out more about core and buffer areas here.